KTM has quickly become a common sight at the forefront of the extremely exciting World Supersport 300 championship, and among others Luca Grünwald has been one of the guys piloting the fast KTM RC 390 R. We shadowed the rider of Freudenberg KTM WorldSSP Team around the Assen circuit for the second round of the World Championship. Just as the Waldkraiburg man passes inspection, the track is opened for track walks. 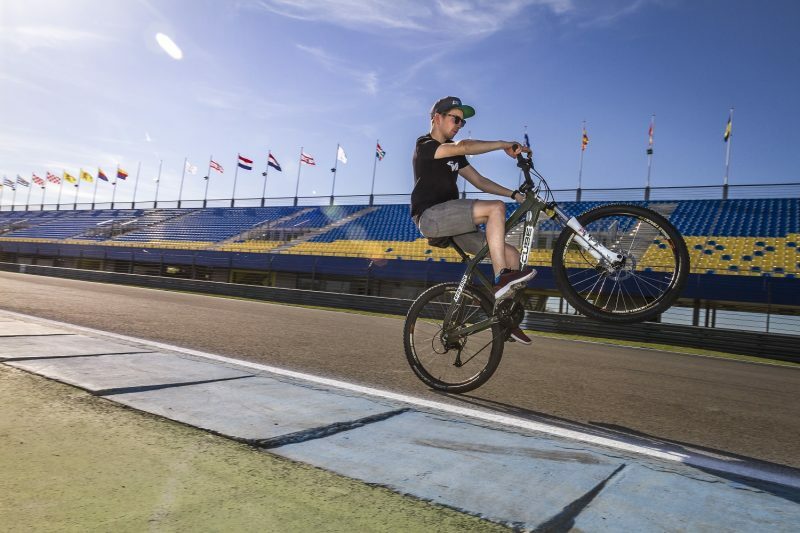 Together with teammate Max Kappler he does a few laps on the Assen TT Circuit on a bicycle to get the right mindset for the coming days. “I believe things could get very exciting who comes out on top here, because Assen’s layout makes it very difficult to gap other riders. It’s going to be a close call, and I hope to be right there at the front,” Grünwald says. Grünwald is hardly content after the first free practice, posting the nineteenth fastest time. 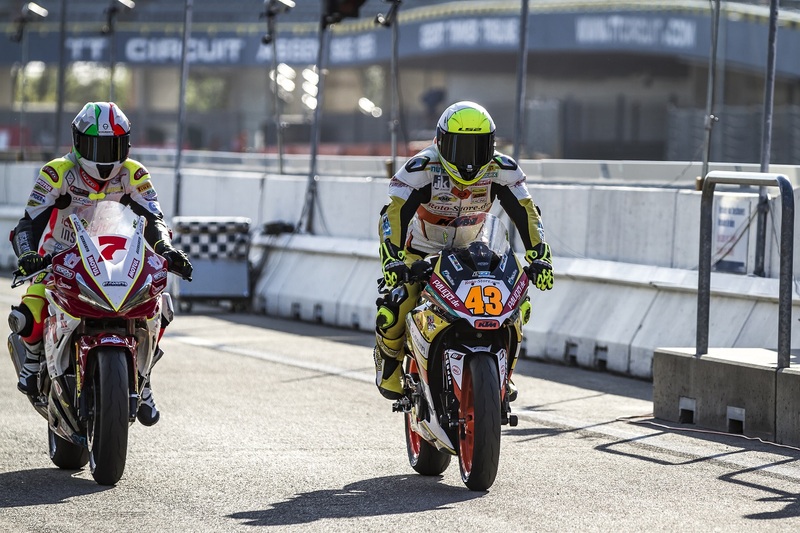 With 1´54.767 he’s a whopping 2.695 seconds slower than fastest man Koen Meuffels, who wrote history at Aragon two weeks before, granting KTM their first World Supersport 300 victory. 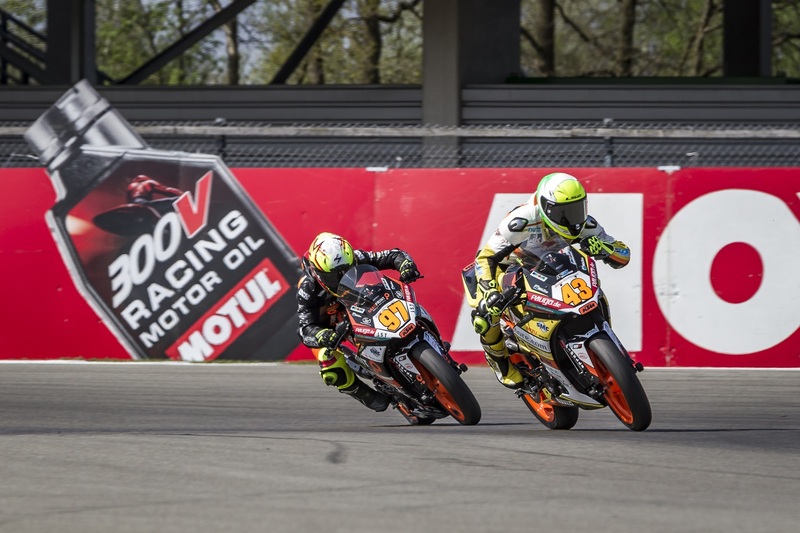 Apart from getting a workout in, the Freudenberg KTM WorldSSP Team rider also uses the Saturday to analyze data and to look back footage from previous sessions, learning from that as he does. “We don’t carry a lot of sensors on the bike but I get plenty of information from the ones we do have. That way we can figure out where there’s progress to be made.” Grünwald manages to make it through Superpole 1 in the end, setting the second fastest time of the session. 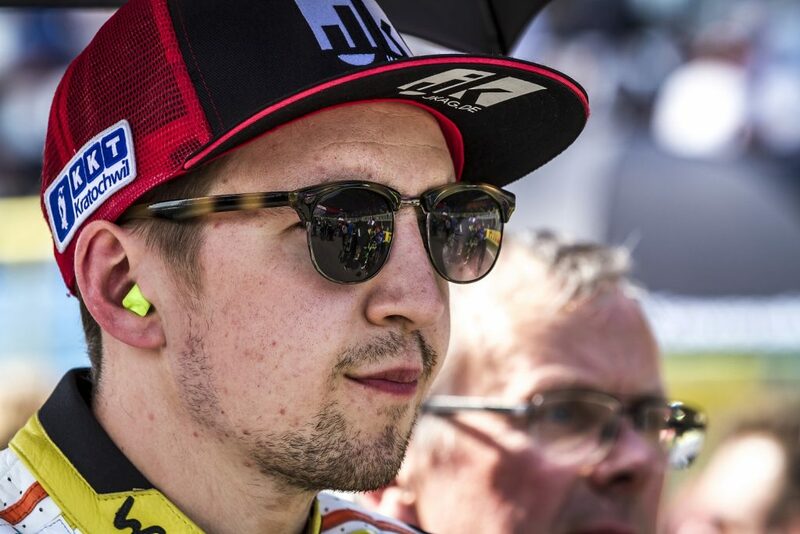 With 1´51.681 he’s allowed into qualifying with the ten fastest riders in the class, but he doesn’t improve on the time set in Superpole 1, leaving him in P9. 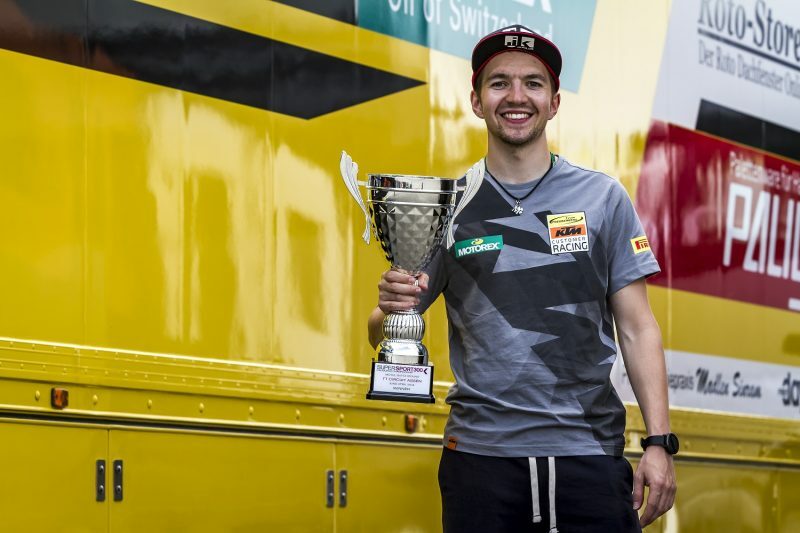 That means he’s on the third row for the race; his second in World Supersport 300. “Tension rises fast on Sunday, and it starts to build early, too. Our warm up session starts at 8.50 am,” Grünwald explains. “I try to focus as much as I can, channeling all I’ve got into getting off the line well. In this class those first few laps are outright war. Contacts a plenty and you’ll find another rider on every possible line through every single corner. After that things ease up a bit and you can start working on a plan,” explains Grünwald. At Assen round ‘making a plan’ didn’t quite worked out for anyone. Right after the start a large and very wild leading pack forms. Setting a strategy and following it has no use whatsoever. 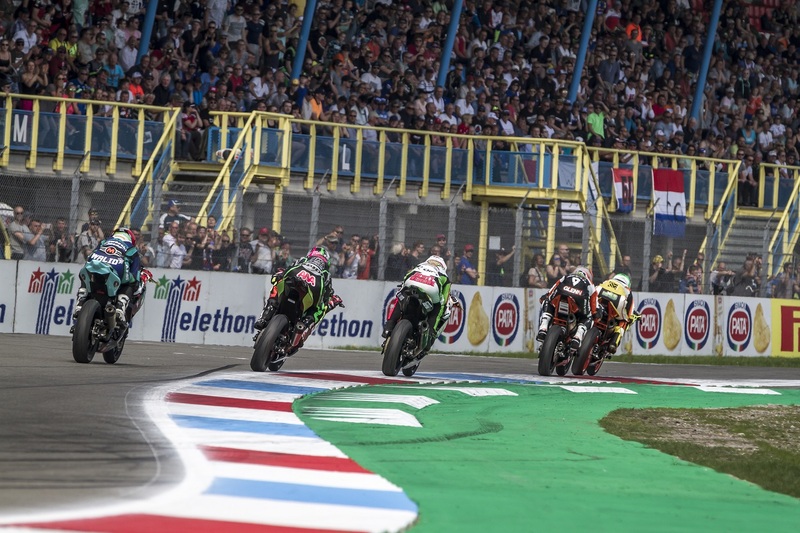 Because a lot of riders received grid penalties, Grünwald was allowed to take off from sixth place, allowing him to slot in with the leading pack. 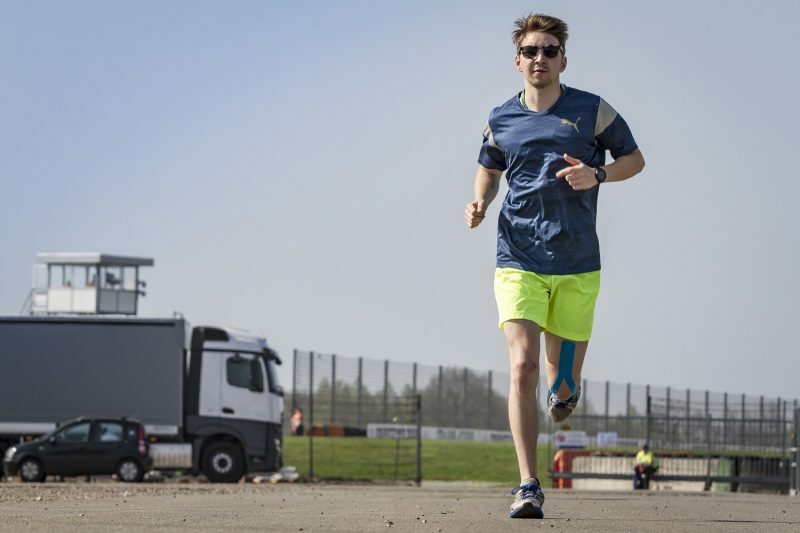 He manages to stay with the leading bunch right until the final lap, striking in the final chicane – the Geert Timmer-bocht. With a small sprint to the line, Grünwald manages to outdrive fellow competitors Glenn van Straalen and Scott Deroue to the line, taking his first World Championship race victory! Luca Grünwald – still second in the championship – will be racing at Brno this weekend (from June 8 to June 10). 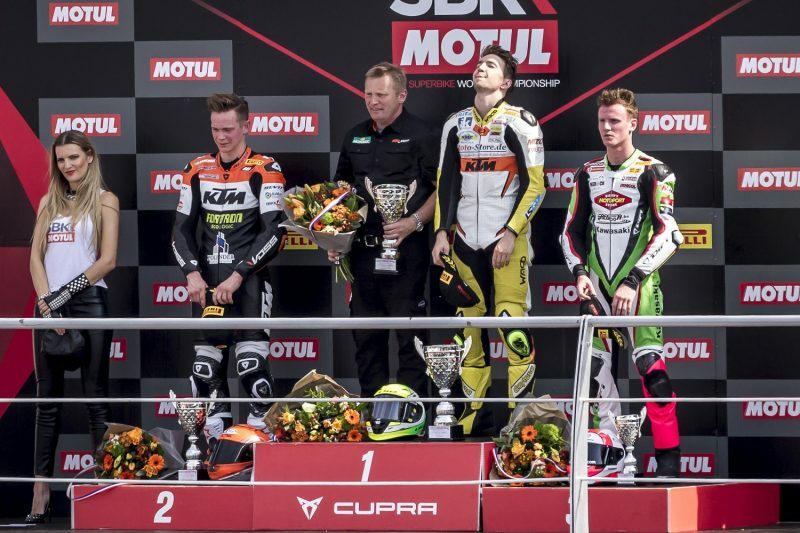 With no German round on the calendar in World Supersport 300, the German KTM rider will go into the Czech round as his home race. Feel like following him? Check out his own Facebook page or that of the team.